Massive nights, picturesque days: There is nothing Claire doesn't love about her summer job in Mission, Massachusetts. Claire is just trying to keep her head down and start a new life after burning out in the city, but those kids out in the woods seem like they throw awesome ragers.... It's only once she's in too deep that Claire discovers the real tourist trade that keeps the town afloat. It's then that her soul-searching in Mission becomes a fight for her life. Robby Asaro is dead. And alive. He's a ghost in the machine, keeping a watchful eye on the arcade where he lost his life two decades before. And the afterlife is good. The best thing ever to have happened to him. But when the conscious electric current formerly known as Robby Asaro makes a decision to protect one of his favorite patrons, Tiffany Park, from a bully, he sets loose a series of violent supernatural events that can't be stopped. Thirty years ago, cynical sleaze ball director Tito Bronze took a tiny cast and crew to a desolate island. His goal: to exploit the local tribes, spray some guts around, cash in on the gore-spattered 80s Italian cannibal craze. But the pissed-off spirits of the island had other ideas. And before long, guts were squirting behind the scenes, as well. They call her Blister. She's a hideously disfigured 23-year-old woman, living in a shed next to her father's house, hidden away from the world. Jason Tray is a successful cartoonist, banished to his agent's lakeside cabin for a few days of mandatory rest and relaxation. One night, while hanging out with a couple of the locals at a dive bar, he takes them up on their offer to go "see Blister," having no idea what they're talking about. Very Surprisingly Story about humanity. Evan Portin is at a sad, scary place in his life. While taking a long walk to compose himself and figure out where to go from here, he encounters a young woman being mugged in a park. When he tries to intervene, he discovers that she doesn't need his help. At all. Her name is Harriett. She is very, very good at defending herself. Everything she owns is in a large backpack. She's never seen a cell phone. She's never been in a car. She's never really ventured into the outside world. And she says she's traveling across the country to slay a Cyclops. She's crazy, right? Five strangers drawn together at a roadside bar on the outskirts of Las Vegas. One rampaging monster, escaped from a secret facility, absorbing victims and accumulating biomass as it moves north from Arizona. The miles between them rapidly dwindling. No, this is not the world’s best math problem, it’s Exponential. 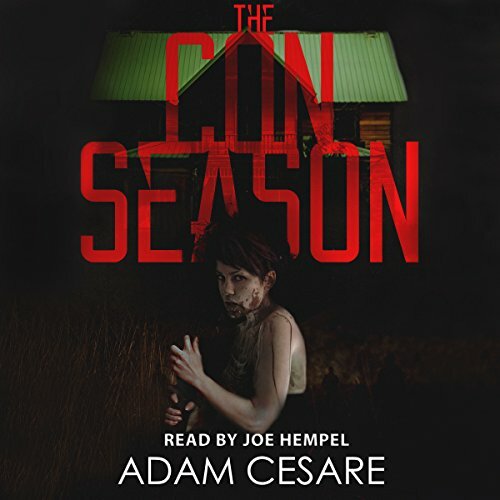 The rollicking, brutal, gory, and strangely poignant horror novel from Adam Cesare. Criminals and screw-ups need to face down science run amok in this literary tribute to films like Tremors and The Blob. Horror movie starlet Clarissa Lee is beautiful, internationally known, and completely broke. To cap off years of questionable financial and personal decisions, Clarissa accepts an invitation to participate in a "fully immersive" fan convention. She arrives at an off-season summer camp and finds what was supposed to be a quick buck has become a real-life slasher movie. Deep in the woods of Kentucky with a supporting cast of B-level celebrities, Clarissa must fight to survive the deadly game that the con's organizers have rigged against her. A demented, funny, bloody, and strangely poignant horror novel from the acclaimed author of Tribesmen, Zero Lives Remaining, and Mercy House. A hilariously twisted take on Fan Cons. This book is a roller coaster funhouse ride basically satarizing the Fan Cons. It starts with Splattercore horror move director being kidnapped, and brought to a mysterious location, where he will set up the filming of an "immersive" horror Con. So immersive, the B list scream queen and several other b list horror actors will find out just how real the horror can get, as they are chased around by a huge man in a horror outfit and mask. The action takes a fast paced gory turn from there, with their lives truly on the line, and even the fan attendees getting in on the action. twisted, sad and funny by turns, the story grabs you and never lets you go. 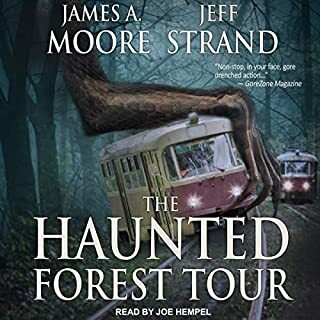 Joe Hempel's narration is great as always, with his voicing of the aging scream queen and the main villain really standing out! He really brings the story and all its blood soaked glory to life. I was voluntarily given a review audiobook copy for free by the narrator, author or publisher through Audiobookboom. A new kind of horror con. If you could sum up The Con Season in three words, what would they be? What was one of the most memorable moments of The Con Season? The blending of a horror con with a slasher movie. What does Joe Hempel bring to the story that you wouldn’t experience if you just read the book? Joe breaths life into Adam Ceasar's words. Who was the most memorable character of The Con Season and why? This book is pure fun. From the characters themselves, to the setting (fan cons), to the plot as a whole, this story is survival horror at it's best (with a solid dash of silliness to even it all out). I was at times surprised and always interested to hear what came next. Hempel does a tremendous job, as always, and Cesare is masterful. Survival Horror at it's Best!! 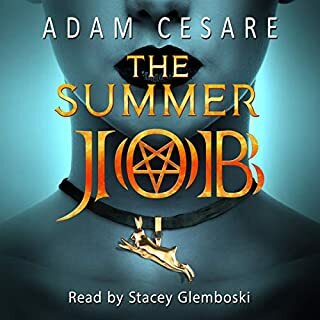 Where does The Con Season rank among all the audiobooks you’ve listened to so far? This is in my Top 20 for all the audio books I have listened to so far. It was a great short story with an excellent narrator. The story was very well done and you kept guessing through out the whole thing as to what could happen. Some parts were obvious and meant to be and others were not to and kept you guessing and made it really fun. Mr Hempel really brings a story to life. He is just an amazing narrator and doe a super job with all the different characters. "This review copy audiobook was provided by the author/narrator/publisher free of charge via Audiobook Boom." I was offered a copy of this book in audio format from the narrator in exchange for an honest review. The mysterious MTY organizes a Horror Con and invites several B-level actors as main guests. The Horror Con takes a turn for the worse when they discover that the main act is much more real than they expected. 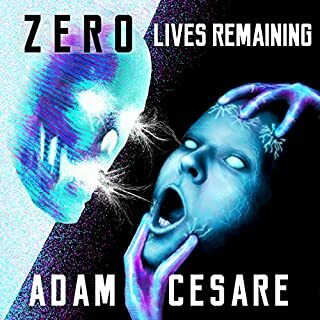 This is my second book by Adam Cesare. Some people judge this one to be inferior to Tribesmen, but I have found it very entertaining. The story is not for the ones light of heart. There is suspense, there is blood, and there is gore. Everyone seems expendable, and it is quite unpredictable. We are given a little bit of background of the characters, but the information about the actors is scarce and at some points I had troubles to remember who was each one. I think the story would have worked incredibly well on screen. There is a lot of build up, introducing the characters and building up the tension, but I found the resolution a bit too rushed. I would have liked the horror to be kept for a little bit longer. The book is narrated by Joe Hempel. Let me tell you that when books are narrated by him I am more open to different styles, because I know that Hempel will put his personal touch and make the story greater than it is. 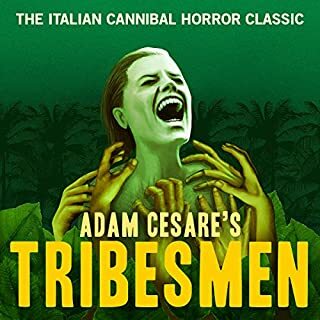 I enjoyed this audiobook, and recommend it if you liked Tribesmen and are into horror and gore. What did you love best about The Con Season? A fascinating story full of horror and strong characters. It kept me wanting more and the story was solid and full of surprises. Great, stellar performances by Joe as always. Loved the narration. Yeah, so the title to this one isn't my best, but it really sums up the book. The Con Season takes a simple premise (what if someone held a horror fan con where the B list film stars were hunted by a slasher?) and turns it into an enjoyable ride. The premise is simple, the narrative is compelling, the characters are all diverse and believable... I dare say my favorite was the poor director who got ambushed in the beginning. Poor guy, but his thoughts on watching the whole thing were almost like breaking the fourth wall. I get ahead of myself though. The book follows several B-list horror film stars as they are approached by a gentlemen recruiting them for a horror con taking place at a summer camp. It also shows the killer's POV from time to time too, but unlike most stories when they show the killer's POV, it doesn't take away from the tension. Instead, it ratchets it up so that it's almost like you're watching a slasher film as you're reading it. It cleverly keeps the audience in the loop, so you're free to scream at the book, "NO WHAT ARE YOU DOING YOU STUPID CHARACTER?!" In that sense, it's really like the slasher films that I love from the 80's, complete with the sly wink-wink at the camera. However, it takes so long setting up the characters, the setting, and the narrative... when it comes to actual bloodbath? It seems like it's over in a blink. I would have loved to have given it five stars, but it almost feels like the end is just... too rushed, too fast, without enough of the slasher hunting his intended victims. I did love the ending, but it just came too soon, IMO. Joe Hempel's narrative is spot on. It's what I've come to expect from him, and while I hate to be like, "Oh yeah, he hit it out of the park again, ho-hum"... he hit it out of the park again. His narration is NOT ho-hum. He infuses a lot of life and character into the prose, making the characters come alive and painting the scene and action with the words of the author. And the prose itself is pretty good. I loved the story. I loved the ending. I loved the characters. I just wanted more of it. Definitely worth picking up! Adam Cesare delivers on another splatterfest in classic 80's style with some millennial twists. Joe hempels narration is spot on yet again. The pair delivers a product that will leave you wondering what's next as well making you squirm in sympathetic pain with the characters as they suffer. Well done can't wait for more! As a fan of cons I truly enjoyed this twist. 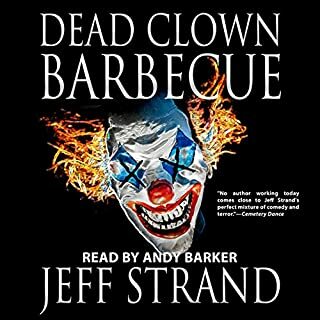 I was voluntarily provided this free review copy audiobook by the author, narrator, or publisher. What other book might you compare The Con Season to and why? 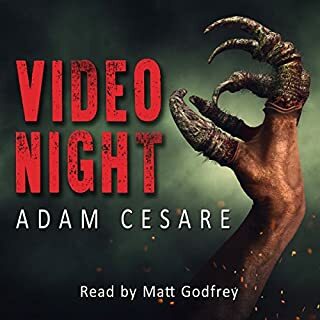 the narrator was amazing he did a excellent job with the different voices the author Adam is an a excellent writer I like horror movies.